Over 50 years ago this article was penned discussing – Florida and the wealth of plant material being grown for indoor use. Florida is still a major producer and many nurseries and plants have come an gone. However, the core plants grown have not changed. Albert’s and Merkel use to carry plants on every house plant collector’s wish list. I hope you enjoy the article. The tremendous demand for decorative indoor foliage plants due to their increased use in modern interiors has turned peninsular Florida into a production center supplying plants to the whole country. The near-tropical climate of Florida speeds propagation, and growing conditions are amenable the year round. Under uncounted acres of slat-shades are growing millions of seedling tropical plants that will eventually decorate suburban homes from coast to coast. Plant explorers have brought back many of the “new” plants and are as busy today as in the days of Captain Bly. A few plants of a rare new species are imported for stock and are propagated here by seeds and cuttings. The hybridizers are at work, too, producing new forms, breeding for durability, variegation and other desirable qualities. There are delightful new rubber plants, exciting philodendrons, enchanting little peperomias and even a vining anthurium. The adaptability of all these genera to indoor conditions is a proven fact. The new forms offer the same durability as the old friends, plus a new look. The rubber plant (Ficus elastica) has been a favorite house plant for a century, and many other members of the fig family are noted for their indestructibility as indoor plants. The numerous species are native to tropical regions around the globe. Some are vines, some are shrubs and some are trees to 80 feet. The banyan tree from India, grown as a curiosity in southern Florida, is a member of this family, as is the delicious edible fig. Two newly introduced ficus include Ficus decora and F. radicans. F. decora is similar to, but more compact than, the familiar rubber plant (F. elastica), and its broader and more oval leaves are placed closer together on- the stem. It has the same outlined midrib, and the new leaves are reddish when they begin to unfold. The plant is tall and sturdy and grows in light or shade. Ficus radicans variegata is a variegated form of an old friend. It is a small trailing vine with 2-inch leaves that has been known for a long time but is just now being propagated in sufficient quantity to be available to home gar deners. It is a dainty little thing, just as durable as F. radicans, and answers the question of what to put in the shady end of a planter. It can be trained up a tree-fern totem for height, grown trailing from a hanging basket or bird cage, and used decoratively in wall brackets. Philodendrons form the backbone of any indoor planting, and numerous varieties are now available. They come in three growth forms: the climbers or vines, the self-heading types which grow from a central crown, and hybrids of these two which are called semi-selfheading. These last two forms are low climbers which hold up their own heads for quite a while and increase in height very gradually; large plants need a totem for support. Newest of the climbers is Angra Dos Reis, as exotic and tropical as its Brazilian homeland. Each large leaf has the high gloss of a well-shined shoe. It was recently introduced into Florida as an unidentified new species and given this distinctive name. It is characterized by maroon blotches on the stem, and the foliage is green, top and bottom. P. Espirito Santo was unnamed when imported. Its name honors the Brazilian state in which it was found. It is quite different from any previously introduced species. The three-pointed leaves are shaped like arrowheads, and the plant is what might be called semi-dwarf. It is not a true dwarf, as the average plants are 2 to 3 feet tall, but it is more diminutive than the general run of self-heading philodendrons. Doubtless this species will be used for breeding to capture its sharp leaf pattern and modest size, characteristics which may well be the trend for future hybridization. Philodendron Tricolor is an exciting new hybrid. One parent is P. hastatum variegata, a variegated climbing variety that was a sensation when introduced and is still a collector’s item. The other parent is the pioneer self-heading species, P. wendlandi. As a result, Tricolor is a compact plant with white and cream along with green leaves from a very short central trunk. This is a plant for the connoisseurs. Unfortunately, not all variegated plants produce varicolored offspring, but propagations of Tricolor are just as gaudy as could be wished, and every leaf is gaily splashed with color. 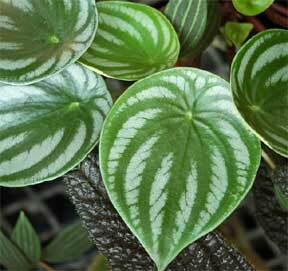 Peperomia “Little Fantasy” is the most fascinating plant of the year. It is a miniature, not over 2 or 3 inches high, with small leaves crowded together in a cluster as though the pinkish stems were tied around with a string like a bunch of parsley. The leaves are deeply rippled and so dark green as to sometimes look black. (This variety is called Emerald Ripple by some.) At intervals several white catkins rise on slender stems above the foliage. The contrast is a fantasy and a plantsman’s dream. Peperomia Sweetheart is similar to the more familiar P. Sandersi (better known as the watermelon-begonia), the main difference being the heart-shaped leaves in Sweetheart. Anthurium scandens, a climbing form of this familiar family, has long, narrow leaves stretching to 12 or 18 inches in length. It does so well in shade that it is one of the best house plants for a poor plant location indoors. The blossom is inconspicuous and bears little similarity to the thrilling red or pink blooms of Anthurium Andraeanum, but the flower is followed by a charming cluster of pearly white grapes. Syngonium Imperial White is a new small- climber with lovely white leaves edged in green. It is similar in appearance to some of the fine caladiums. It makes a compact little plant for several months but as it grows tall, it should be given a nicely curved piece of driftwood to hold on to. Both this and Anthurium scandens increase in height so gradually that they are ideal for indoor decoration. These are but a few of the new plants available from Florida. You’ll soon be hearing more about exciting plant introductions whose names are new and news!. Homes and Garden Decorating – Beware of Catalogs! Leea Coccinea – Do You Know This House Plant?